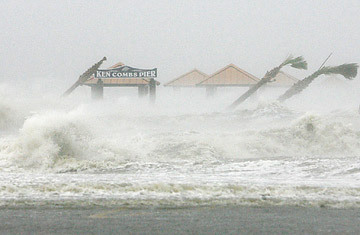 Waves generated by the storm surge from Hurricane Gustav crash over the newly-rebuilt Ken Combs Pier in Gulfport, Mississippi on Monday, September 1, 2008. Skies remained stormy and tropical storm force winds from Hurricane Gustav continued to pummel the three counties of the Mississippi Gulf Coast Monday night. A threat for isolated tornadoes remains, and a curfew, enacted Sunday at 10 p.m., will stay in place until the weather improves and damage-assessment teams can determine whether it's safe for evacuated residents to return to their homes and businesses to re-open. But Gustav has certainly weakened and, as of 4 a.m. CT Tuesday, its top winds had dropped to 35 mph, making it a tropical depression after a long run as a hurricane, according to the National Hurricane Center. Hancock County took a heavy hit from Hurricane Katrina, with cities like Pass Christian, Bay Saint Louis and Waveland almost erased from the map. Today, three years later, the county is still struggling to recover, and Gustav has dealt yet another devastating blow. County public information officer Jim Keller said this storm's impact took them by surprise. "Wind damage is at a minimum, but we've got areas with 12 to 14 feet of flooding," Keller says. "We were thinking eight or nine feet." Although people in low-lying areas were given a mandatory evacuation, Keller says several hundred chose to stay behind despite a cut-off time to change their minds. On Monday night, as winds continue to gust to 50 mph, three search teams are trying to reach residents in need of rescue. Food and ice distribution points are expected to be established on Tuesday. Still, the words on everyone's lips are: "It wasn't another Katrina." Jim Pollard, public information officer for neighboring Harrison County, says he remembers a chilling moment during Katrina when officials at Hancock County's Emergency Operation Center  believed to be on safe ground  called him on the phone and told him the building was rapidly filling with water. "They all wrote numbers on their arms with indelible ink, then listed their names and numbers on a sheet of paper, put it in a Ziploc bag, and tacked it to the roof," Pollard says. "We were taping final messages from them to their families." Pollard says it's too soon to tell how hard his county  which has a population of 175,000 and encompasses the cities of Gulfport, Biloxi, D'Iberville, Long Beach and Pass Christian  was hit by Gustav. Teams are just beginning to assess the damage, and it will be several days before a real picture of the hurricane's impact emerges. In addition to Gustav's 12-foot storm surge, rain has been heavy, and three rivers in Harrison County are expected to crest above flood stage tomorrow, further complicating matters. But Pollard says things went smoothly for the county thanks to good planning and a new initiative by the Mississippi Emergency Management Agency, which coordinated with the state department of education to transport 539 people by school bus to shelters in Jackson, Miss. at no charge. Late on Sunday night, the county opened nine area schools, bringing the total number of sheltered residents to just over 1,300. In addition to new plans to protect the people of Harrison County, a new Katrina-inspired pet initiative also drew praise. Misty Velasquez, director of development for the Humane Society, said a pet-friendly shelter opened this year, sparing many animals the fate of those left behind following Katrina. In addition to the usual assortment of dogs and cats among the 44 animals being sheltered tonight, there are also rabbits, a parrot and a Gray-Banded King snake. Officials in both Hancock and Harrison counties said they hope to allow residents to return to their homes soon but the situation remains too unstable at the moment to have an idea when that might be possible. "This event is ongoing, and we're not out of the woods yet," Pollard stressed. "We're not going to send assessment teams out on a large scale until it's fully safe."